Disclaimer: This set was bought with my own money and Restyle did not request a review. 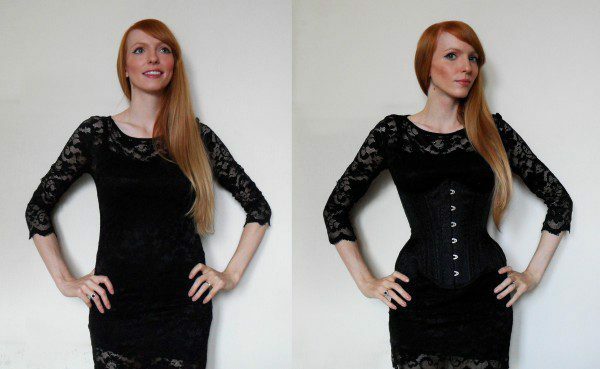 I’ve been after a decent black underbust corset for ages but what with being pregnant recently and not wanting to buy one too quickly afterwards, I’ve had roughly a year to do my research and find one that ticked all my boxes. Basically, I wanted something with a pretty dramatic shape, and I didn’t have a huge budget. What Katie Did’s Morticia (though they’ve just released the even curvier Vamp) and Isabella’s Corsetry’s Josephine were the two main contenders until someone on Reddit pointed me in the direction of Restyle. It’s not a brand I’d heard of before and I would probably otherwise have passed these off as cheap ‘fashion’ corsets, but after watching corset expert Lucy’s YouTube reviews of all three corsets (her review of this corset is here) I was surprised to see that Restyle’s corset was at least as curvy as the other two despite being considerably cheaper. I’d planned to spend £100-£150 on a corset but if I could get what I wanted for £33, why not? I bought the jacquard brocade version of this corset (it’s also available in plain cotton) which is a pretty standard but nonetheless nice-looking embroidered fabric. It’s a simple, relatively plain underbust corset but then plain is the look I was going for – so it would match lots of lingerie and outfits – and nothing about it looks cheap or flimsy. The outer fabric is polyester and it’s lined inside with cotton. The corset has 24 steel bones, 2 on each seam (spiral steel for flexibility and comfort, except for the flat steel busk and the bones either side of the grommets for strength) and a very wide modesty panel. It also has a modesty placket at the front that’s just under an inch wide, and thick, shoelace-style lacing at the back. The shape of the corset is what I’d call a ‘dramatic’ curve. It goes in at the waist and then flares right out at the hips, making the waist look even smaller. Overall, this feels like a sturdy, well-made corset and it’s shaped for killer curves! Not bad for £33 eh? My natural waist is about 25.5″. I wanted to buy this in a 22″ size but it was sold out and I was too impatient to await restocking, so I ended up with a 20″. I can’t lace it fully shut – I can lace it down to about 23″ – but thanks to that super wide modesty panel at the back that’s not a problem and no skin or clothing shows through. I was pleasantly surprised at the shape this corset gives. Sure, it looked super curvy in Lucy’s video, but then she’s been wearing corsets for years. I rarely wear them and I don’t naturally have a particularly defined waist, yet from the very first time I put this on my waist looked tiny! This corset is also surprisingly comfortable. As someone who’s not used to corsets I can wear this for 7 to 8 hours no problem before it starts to get a bit ache-y. Due to such a dramatic hip flare, there’s a small gap at the hips on me. My main issue with this corset though was the length. I’m 5’3 and the top of the busk which is cut to point upwards sits quite high and overlaps the gore of my bra. This means that if I pair it with an underwired bra, the bra’s wires dig in painfully. So I’ve only been able to wear this with soft, non-wired bras. However if you’re taller than me this may not be an issue for you. Neither the Restyle website nor the product label give any washing instructions. I’ve wiped the inside with a damp cloth after wearing it against the skin, and if you’ll wear it this way regularly you’ll probably want to get it dry-cleaned from time to time. 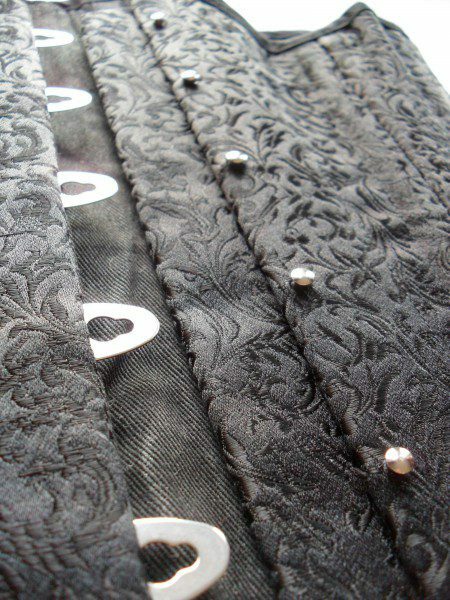 The Restyle brocade underbust corset costs €41.53, or roughly £33. That is excellent value for money. It is the curviest, most comfortable corset I’ve owned and although the fit wasn’t spot on, for this price I have no complaints whatsoever. Absolutely. This may well be the best-value underbust corset you can buy with £33! You can buy it direct from Restyle in Poland where it is currently restocked in every size from 18″ to 32″ – shipping to the UK was less than a week if I recall. What do you think of this corset? Are there any other cheap underbusts you’d recommend? Can you give me some advice on the fit of this corset? I’m not sure if I should order the 22″ and the 24″. I don’t want spillover, but I also don’t want a gap. Hips: 38? High Hip: 36? Waist: 28? Underbust: 33? Torso: 10? thanks for the review as well this is so much useful info! hi I bought this after watching Lucy’s video too! only got it a few days ago and wondering if you have worn it often and if it’s held up well? and also do you waist train? Lucy had said this corset would be a good cone shape to pull the lower floating ribs in, I was wondering if you had any change in waist since wearing it? sorry for all the questions and thank you for this review, so useful! Do you mean spillover/gaping at the hips? I’m probably not the best person to advise on fit for this. I can tell you that the 20″ I bought was made for someone with much wider hips than mine (31″ high hip) as there was about an inch gap either side. This style is made for someone with a naturally very curvy shape. I haven’t worn this for a few weeks due to being abroad without it, but before that I was wearing it once or twice a week for 8-10 hours at a time and it’s held up perfectly fine so far. It does pull my ribs in a bit but I don’t waist-train so it hasn’t changed my natural waistline, I haven’t worn it regularly enough. I’d say it’s suitable for waist training though – it’s a very strong corset and comfortable enough to wear often! Hello! Thank you for putting up this review it helped (along with Video reviews) decide on Restyle as an option. I do have a question on your personal experience when you were breaking in the corset. I have noticed that while I am breaking this corset it the corset tends to want to twist slightly on me. However, none of my other corsets have any twist in them. Was this something you also experience? The twist is very slight and I have a feeling it is because the inner layer stitching runs in the same direction for all the panels. Again, love the review and look forward to reading more! Hi Theana, glad it helped 🙂 I didn’t notice any twisting of this corset on me, no.